Fashion retailer DV8 has become the first of the 14 Belfast businesses inside the cordon around the fire-damaged Primark site to confirm a new temporary premises. The clothing chain is set to reopen in the ground floor of the CastleCourt shopping centre within days. The complex currently has around 12 vacant units. DV8 and retailers including Zara, Tesco and Argento have been left to explore relocating to new units in the city centre after Belfast City Council said on Thursday that the safety barrier around the Bank Buildings site will remain in place for at least four months. The council has also said it will this week begin assisting the 14 traders located within the cordon who wish to access their property. Yesterday Primark confirmed that the cost of replacing its Belfast store will be covered by insurance. The interruption to the clothing firm's business was also underwritten, an update from the retailer's owner Associated British Foods (AB Foods) said. The front section of the listed sandstone building, which was being refurbished and extended at an estimated of cost of £30 million, was destroyed by last month's blaze. 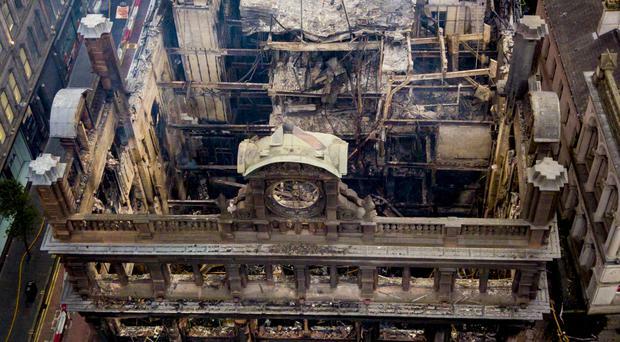 A statement from AB Foods said: "The Primark store in central Belfast was sadly destroyed by fire in August. All staff and customers were quickly and safely evacuated from the building. The replacement cost of the building and resulting business interruption is insured." Primark has said it will continue to pay its Belfast workers until December 31. Around 300 people worked at the discount fashion chain's Castle Street store. Shopworkers trade union leader Paddy Lillis from Usdaw said a deal with staff provided some guarantees for the future. The company is aiming to have them back in work from Monday, September 17, and will be allocating individuals to other Primark stores, he added. The firm is holding one-to-one discussions with staff to ensure issues like additional travel expenses are resolved. Mr Lillis, Usdaw general secretary, said: "Usdaw has been supporting our members and reps affected by the fire through this very difficult period and we have been working closely with the company to get the best possible deal for them. "What we have agreed so far provides some future security for staff and we will continue to support, advise and represent our members through the transitional period and beyond. "This has been a tough time for the staff and all concerned and it is going to take time to get things back to normal, if that is even possible. "We welcome the company restating their commitment to Belfast and we will be working with them to deliver on that." Belfast City Council said a dedicated phone line has been set up (028 9027 0483) for those affected.